My first college horse show! Congratulations. I remember how fun it was to work with the Arabians at Cal Poly. I never showed them, only rode for lessons and worked with the yearlings and mares. How tall was Captain, since he is a Connemara? He's a pretty pony...looked like a buckskin...couldn't see clearly if he had a dorsal stripe running down his top line which would have made him a dun. Can you tell us EriNC? I remember seeing an International Show Jumping Event where riders like Meredith Michaels-Beerbaum and Beezie Madden had to switch horses and try to jump the round clear with someone else's horse. They were able to use their own saddles however. I can't recall which event that was. I think Beezie did good on that round. OK...it was an Alltech FEI Show Jumping "change-horse" final four event. Beezie received a bronze. He is a buckskin. Im not sure how tall he is, but in a picture I have my head clears his neck. I am 5 feet 6 inches tall I am guessing he is about 15 hands, while not technically a pony, it is an accepted height for the breed. I loved riding Intercollegiate! 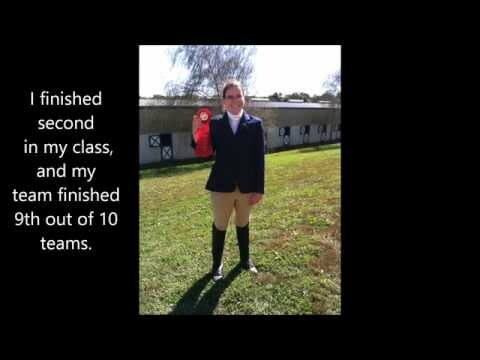 A different horse every show with only a short warm-up together really tests your riding skills! What college do you ride for? I ride for The University of North Carolina at Greensboro. When were you at Cal Poly, Especially_Horses? My son went there in the early 90s. He never got into the horses, unfortunately. He was a Computer Information Systems Major. Very nerdy. So I had my Second collegiate horse show today, and I got 3rd out of 6 in my class! There is no video because my mom refuses to come to anymore of my shows. I drew Kiwi an Appaloosa pony from my home barn. I seem to draw ponies more than horses. I wonder why? I now have 9 out of 36 required points to move to the next division. That's great! How much fun are you having! A lot of colleges will put a height and weight limit on ponies - I bet your name gets thrown in cause your just right for them! Despite the fact the I am 5'7' I used to draw them too, they were a blast to ride!